As an addition to our prior article, Samsung NX3000 vs NX300, we once again conduct a comparison article of Samsung’s smart mirrorless digital cameras. This time, the contenders are a returning product, Samsung NX3000, and Samsung NX500. Once again, the contenders have a lot of resemblances and similarities – not only the looks, but also some functions and features, as well as the way we use these cameras. However, their prices are different matters: Samsung NX500 is significantly more expensive than Samsung NX3000. The gap is usually around a few hundred dollars. So, should we spend our money for Samsung NX3000 or Samsung NX500 in order to get the fullest value? The primary thing that the manufacturer boasts with the NX Smart series is the smart features. Considering that everything in our daily life is getting ‘smart’, from kitchen blenders to watches, why don’t make our cameras smart as well? Samsung NX3000 and Samsung NX500 both feature built-in Wi-Fi connectivity and NFC technology. With either of these models, you can share your pictures and videos instantly to your friends and family. You can also upload directly to your social media or e-mail. 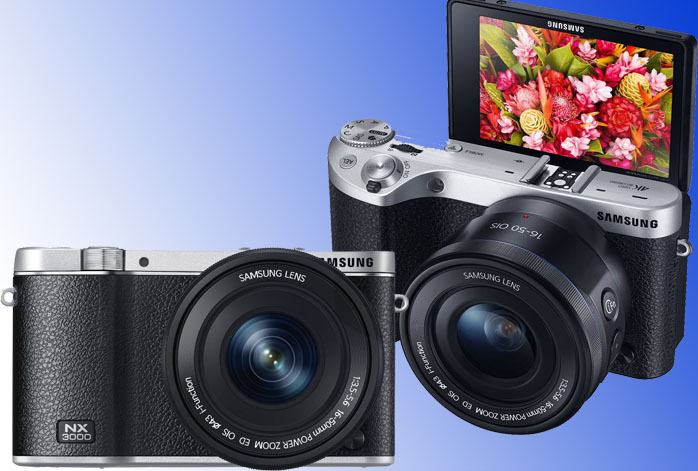 Samsung NX3000 and Samsung NX500 support DirectLink and MobileLink for easy data sharing, PC Auto-Backup, Remote Viewfinder PRO for the ultimate controllability, and even baby monitoring. Both models come with articulating screens, external flash shoe RAW support, face detection autofocus, and AE Bracketing. The cheaper Samsung NX3000, however, only has a handful of points that can make it better than Samsung NX500. Besides being more affordable, Samsung NX3000 is also lighter by about 57 grams (it weighs 230 grams while Samsung NX500 weighs 287 grams), and has larger pixels. Thus, Samsung NX3000 can have slightly better low-light and dynamic range than Samsung NX500, though this difference is not very much noticeable. Samsung NX500 brings a lot of improvements compared to Samsung NX3000. It has a higher sensor resolution (28MP vs. 20MP), so it can capture more detailed images. It can also record videos in the Ultra HD 4K resolution, while Samsung NX3000 still offers the Full HD 1080p. Samsung NX500 comes with 51,200 maximum ISO and 209 focus points. Thus, its pictures can have excellent color accuracy and sharpness. Samsung NX500 makes a better choice for snapping pics of fast-paced actions and sports thanks to the 9fps photo burst and 1/6000s maximum shutter speed. Also, Samsung NX500 is now armed with touchscreen control. Considering that Samsung NX500 has a lot more benefits than Samsung NX3000, if you can afford it, then you should choose Samsung NX500 over Samsung NX3000!